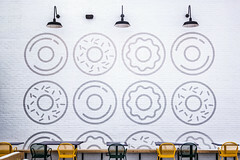 40 VISUALS is always working with clients to create custom signage solutions that fit unique places. 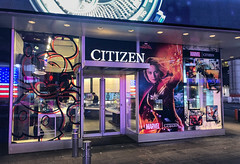 In this case, it was the showcase inside the Citizen Watch Flagship Store in NYC. 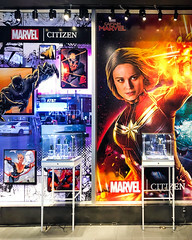 The display was made with multiple pieces of Printed Acrylic to form a base and stand that fit neatly inside the showcase, behind the products. The end result was stunning. 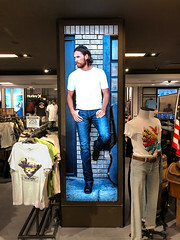 A perfect showcase signage solution for a custom retail environment. We sat down with Lacey Hensen, our lead designer, to discuss the process of creating this custom acrylic display and the challenges it presented. Rachel McCoy: How did you decide on the application for this project? Was this acrylic requested specifically by Citizen, or was this a collaborated idea brought on by you? 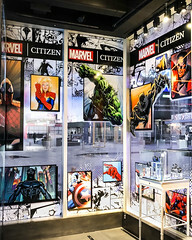 Lacey Hensen: Everything was requested by Citizen, except the Acrylic and Plexi Glass display case. The material was recommended by myself, based on past experiences. I worked together with Gabriel Guerrero, our custom fabricator, to engineer a way to get the Printed Acrylic to stand up straight in the case. We decided to route a channel into the Acrylic base, to insert the vertical piece. This took some trial and error to get the perfect fit! 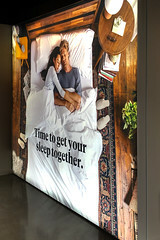 Rachel McCoy: Did you encounter any problems with the artwork that was sent by the client for this display? Lacey Hensen: When the graphic elements were provided I needed to scale them to fit the desired space. Originally, Citizen wanted the breaks between the Air, Land and Sea images to be on a diagonal for both the window and the display case. Therefore, there were multiple design concepts proposed before finalizing the end product. 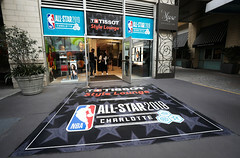 Thanks to our team of experienced designers, 40 VISUALS can fabricate all types of custom signage displays like this. If you are interested in Printed Acrylic or any other custom signage, please give us a call at 800-962-3119 to help!